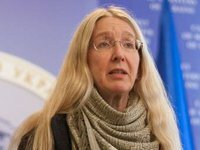 Salary of Ukrainian Acting Health Minister Ulana Suprun in 2016 amounted to UAH 131,431. According to the electronic declaration for 2016 submitted by Suprun, last year she received a salary for her work at the Ukrainian Catholic University in the amount of UAH 107,977. Suprun has UAH 35 on her account in UniCredit Bank, UAH 18,207 in the public JSC Kredobank, UAH 150,525 in Ukrgazbank. The acting minister has $9,080 at the joint accounts with her husband Mark Suprun in Citibank NA, and $43,683 in JPMorgan Chase Bank NA USA. The joint deposit of spouses in UBS Financial Services Inc. make $3.817 million, Ulana Suprun has $471,332 on her pension account in this financial institution. In addition, Ulana and Mark Suprun received UAH 63,532 in 2016 as interests from their deposit in UBS Financial Services. Mark Suprun also has UAH 44,627 in Raiffeisen Bank Aval. Since August 2014, the spouses have been living in Kyiv in an apartment with an area of 128.7 square meters, which is owned by U.S. citizen Christina Pendzola-Vitovych. Until July 2016, Suprun headed the Patriot Defense NGO. In 2015, the acting health minister earned UAH 36,000 as her salary at the Ukrainian Catholic University. Her husband's salary in 2015 was UAH 37,000. In 2015, Suprun and her husband had $55,400 on their joint bank accounts.